We’re doing yet another thing we’ve never done before …Songwriters In The Round! On Friday December 5th at The Wesley Anne in Northcote, we’ll sit in a circle with two other acoustic acts, and we’ll each take turns doing a song. We’ll be playing five of our songs, 8-9:30pm. The audience will sit around us, within arms’ reach. We’ve performed up close to audiences before, but this setting is going to be beautifully intimate, and we’re really looking forward to it. The poster below lists the other acts performing. To make sure you get a seat, you might like to book a table by phoning The Wesley Anne on 03 9482 1333 or to get there early. Doors open at 7:45pm. Entry is $8, and if you tell the door person that you’re an active musician, it’s only $5. We hope to see you (or sense you) there! 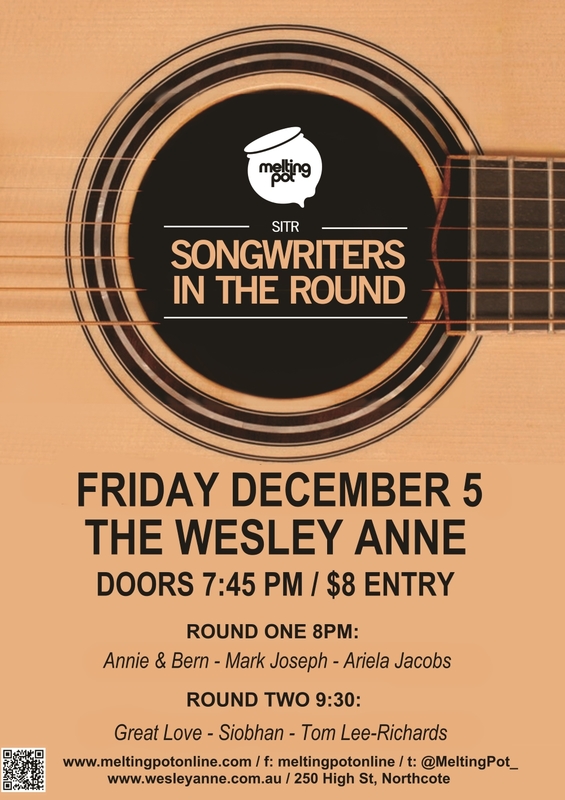 Posted in Past shows and tagged as Melbourne, Melting Pot, Northcote, Songwriters In The Round, The Wesley Anne.